01 | March | 2011 | WHAT A FEELING! A lot of people are explaining the commercial success of Platoon by suggesting that the Iran-contra affair has soured the country on the gung-ho patriotism that has been so popular in recent years. Even the latest from the actor of the Reagan era, Sylvester Stallone, has flopped (Over the Top). Has Rambo run his course? I’m not quite convinced. I suspect the success of Platoon has more to do with the fact that it’s a very good movie, and surely the failure of Over the Top has as much to do with the goofy subject of arm-wrestling truckers as anything else. But if the national climate has indeed changed, where does that leave Death Before Dishonor? Filmed before the Iran scandal broke, this gut-busting flag-waver is lost in a time warp. The script is formula stuff—something Chuck Norris might have turned down. It’s about some Marines in a mythical Arab country who retaliate when a U.S. general (Brian Keith) is taken hostage. Fred Dryer plays the hardhead sergeant who endeavors to get his general free—never mind that the American ambassador (Paul Winfield), a namby-pamby appeaser if ever there was one, urges Dryer to use restraint. Restraint goes out the window after a terrorist drives a bomb-laden truck into the U.S. Embassy in a suicide run. Sound familiar? The film coolly takes recent historical events and allows Americans some fictional revenge. Dryer again bucks his official orders when he joins the Israeli underground and wages a small war to retrieve Gen. Keith. It’s a story to gladden Oliver North’s heart. Dryer gets the job done without paying heed to all those dad-burned rules and regulations. The movie’s so brutally effective that, by quitting time, you’re convince he did the right thing. 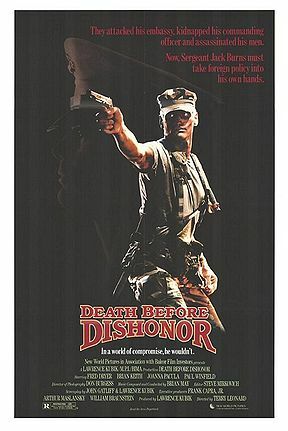 Death Before Dishonor isn’t a big enough property for its success or failure to be an accurate barometer of the national mood. We’ll have to wait see if the next Norris or Stallone film scores big. Norris is working on another Missing in Action movie. He’s criticized Platoon, and complained that if people wanted all that realism they can watch the evening news. The times they were a-changin’, I guess, or maybe they were just moving in that maddeningly cyclical way they have, as hyper-patriotism returned in a big way in the 21st century and Oliver North got his own Fox TV show. This is the kind of movie where the lily-livered liberal is far more despicable than the nominal enemy, an attitude that has secured itself firmly in many an American household by now. The hangover from Vietnam was still with us, which is why Rambo’s line, “Do we get to win this time?”, seems to fuel so many of these sword-rattling 80s pictures. Death Before Dishonor is the only movie directed by Terry Leonard, a famous stuntman and second-unit director who is still going strong these days—he’s credited with stunts on Inception and Death Proof, and he did second unit on The Expendables, appropriately enough. You are currently browsing the WHAT A FEELING! blog archives for the day Tuesday, March 1st, 2011.